Slayer is a handsome five-year-old gray and white Siberian with an “open” mask who fancies himself as a true lover! In fact, this husky boy considers himself a lap dog and just loves to cuddle. Unfortunately, Slayer is a victim of the economy and is looking for a new home to call his own. Slayer’s two most favorite things in the world are going for walks and getting any kind of attention! He knows basic commands and like most huskies, he loves to dig. He has been known to dig out under fences and will need to be in a secure setting where he will be safe and sound with his new family. If you are interested in adding a loyal and affectionate companion to your life, please consider Slayer. 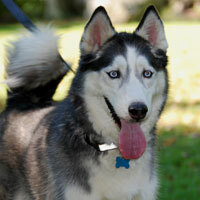 This sweet and affectionate husky is going to make someone very happy!